TBILISI, DFWatch–The leader of the Republican Party says he and other party tops have received an offer from the ruling Georgian Dream to abandon their own party and join them ahead of the election, but they rejected the offer. In an interview with the newspaper Kviris Palitra, Davit Usupashvili said the offer was not put to them as an ultimatum. “GD told us that they needed us [to be] non-partisan,” he said, adding that the Republican members of cabinet decided to finish what they were working on as ministers and then resign. 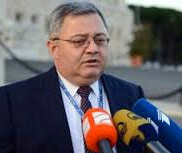 Usupashvili claims the proposal did not cause tension with any member of the Republican Party, nor with the prime minister. He didn’t rule out the prospect of a Republicans-Georgian Dream cooperation if they win the October 8 parliamentary election. The Republicans, which came into the government together with other parties in the coalition called Georgian Dream, announced in March their intention to run in the election independently. Last week, two Republican cabinet members – the ministers for defense and reconciliation – resigned. A third Republican cabinet member resigned from the party in order to remain environment minister.